Over the past five hundred years, historians and other social scientists have perceived an extraordinary occurance: the transition from the Middle Ages, via the Renaissance, to modernity. Equally remarkable has been the transition taking place in the last fifty years from modernity to globalization, a period marked by increasing interdependency and interconnectivity, as evidenced by events such as the advent of the computer. Bruce Mazlish argues that in order to understand ourselves in the world today we need to know more about the nature of both concepts. Mazlish discusses the transition in terms of "reflections." Rather than adding to the enormous amount of archival research that already exists, he instead examines slices of modernity-the way of seeing, the sense of self, for example-as if under a microscope. He sees modernity as strongly marked by its insistence on freedom of political and religious thought and the rights of man (later expanded to include women). Such changes did not happen all at once, but as a gradual development. 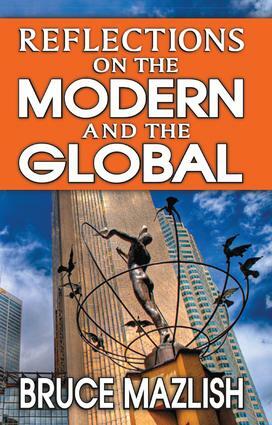 While some prefer to contemplate the transition from the modern to the global as a continuous, seamless development, Mazlish argues that post-WWII developments are best understood in terms of a break or a "rupture." Illustrating that the process was further accelerated by the computer revolution and the launching of artificial satellites, Mazlish places the events of 1989 in the framework of globalization. He concludes by inquiring further into the significance of the transition from modernity to globalization and its impact upon thought and identity.